This is such a versatile dish. Breakfast, lunch or dinner. I used almond milk as it has half the carbs of regular milk and the high protein feta replaces meat. If you are more of a carnivore and miss the meat try different fillings like bacon and onion or leek and mushroom – chopped finely, fried in the butter in a frypan and cooled before added to mixture. You can also try diced chicken breast and corn kernels. Just make sure you cool fillings before adding to the mixture. It also freezes nicely cut into segments for a easy snack on the go. Whisk together, in a bowl, eggs, milk, butter and flour. 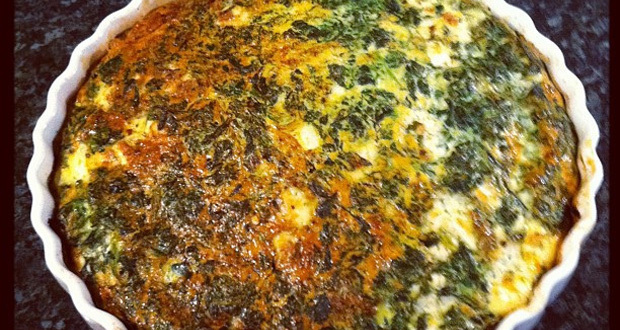 Pour into a 24 cm quiche dish, or Texas muffin tins.